Last season’s Aviva Premiership was famed for the failings of traditional powerhouses: Leicester, Harlequins and Northampton all struggled at times. Here, Josh Bartholomew reviews whether the Saints can bounce back under former Hurricane’s boss Chris Boyd. Last Season: Northampton enjoyed a frustratingly tumultuous season, where they sacked long-time head coach Jim Mallinder, but their campaign wasn’t the car crash some might have expected after a horrific opening display in which they lost 55-24 to Saracens at Twickenham. Recruitment Rating: 8/10. Though key man George North has left the Gardens, his replacement Taqele Naiyaravoro is exciting, electric, and should be present for the whole season. Northampton have done well to offload some of the weaker members of their squad: Ben Foden has moved to America, Campese Ma’afu has crossed the Midlands and joined Leicester, while numerous players have taken a step down to the Championship. Meanwhile, Dan Biggar should solve Northampton’s playmaking issues, and Ben Franks will add much-needed ballast to the front row. Strengths: Northampton are always very difficult to beat at Franklin’s Gardens: six of their eight Premiership victories last season came at home. This could give Boyd’s men the head start they need to improve their ninth-place finish this year. With the signing of James Haskell, Northampton now possess an incredibly strong forward pack, including England internationals Dylan Hartley, Courtney Lawes and Haskell, as well as numerous other powerhouses. Weaknesses: Though Australian winger Taqele Naiyaravoro is raw and potentially match-winning, he is still a relative unknown. This, coupled with the fact that he will carry much of Saints’ try scoring options on his shoulders, is worrying for a squad which appears to be short of attacking force. 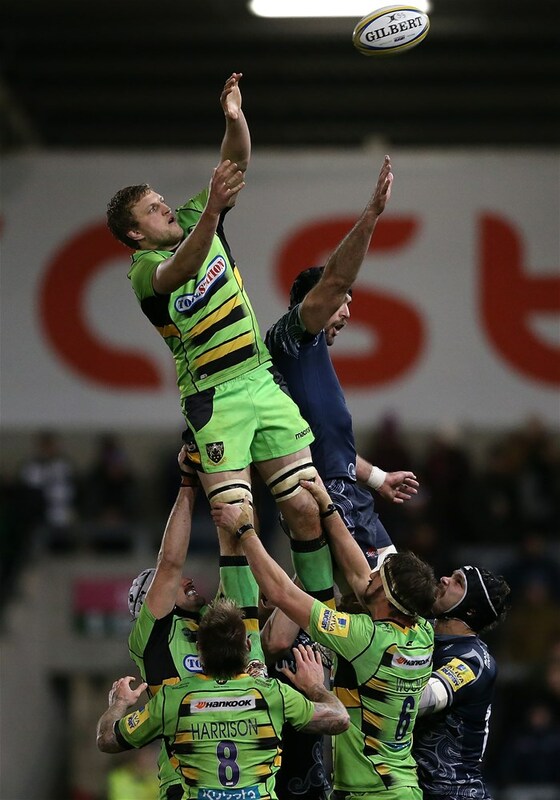 Harry Mallinder could compound this by filling in at fullback again, but he must improve his defence if he is to be considered a worthy Premiership option in the back three. Key Man: After moving from Leicester Tigers a couple of seasons ago, Jamie Gibson was last year met with the adulation his performances have always deserved. Gibson sums up everything that Northampton must be if they are to achieve similar feats to those of 2014: he is hard-working and unerringly successful in attack and defence. Cobus Reinach could also be vital to Saints’ campaign if he can strike up a working partnership with Dan Biggar. Young Gun: When Biggar is away with Wales, expect James Grayson to deputise, especially given Piers Francis’ struggles at 10 last season. Grayson made nine appearances in 2017/18, but Chris Boyd would be guilty of wasting young English talent if he looked past the u20 international in Biggar’s absence. Prediction: Despite some flaws in their squad, Boyd has managed to assemble a group of players which looks capable of mounting a serious top 6 challenge. In the Premiership, sides with strong forward packs are generally successful, and Northampton are one such team. It may surprise some, but the Saints will finish 6th. Ins: Dan Biggar (Ospreys), Taqele Naiyaravoro, Andrew Kellaway (both NSW Waratahs), Will Davis (Ealing Trailfinders), Ben Franks (London Irish), Dom Barrow (Leicester Tigers), Andy Symons (Gloucester), James Haskell (Wasps), Matt Worley (Racing 92), Charlie Davies (Dragons), Joe Gray (Harlequins)*. Outs: Sam Dickinson, Matt Beesley, Jordan Onojaife (all Ealing Trailfinders), Nic Groom (Lions), Charlie Clare, Jamie Elliot (both Bedford Blues), Christian Day, Rob Horne (both retired), George North (Ospreys), Ben Nutley, Tom Kessell (Coventry), Stephen Myler, Tom Stephenson (both London Irish), Keiran Brookes (Wasps), Juan Pablo Estelles (Atletico del Rosario), Ben Foden (Rugby United New York), Campese Ma’afu (Leicester Tigers), Josh Peters, Michael Paterson (both released). *Joe Gray signed for Northampton on a short term loan deal.